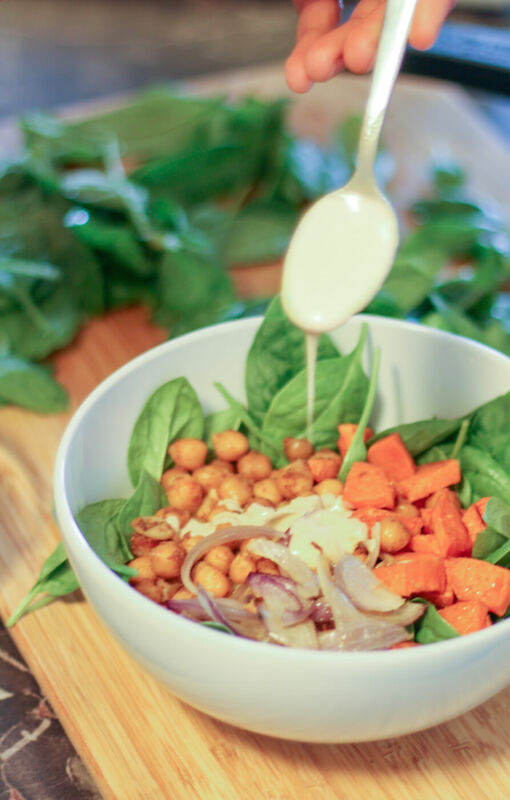 Spinach salad with spicy roasted chickpeas; sweet potatoes, and onions, drizzled with a lemony tahini dressing. I call this salad, “the salad of salads” because it is a nutrition powerhouse — proteins, fibre, carbs and lots of vitamins and minerals. Weekday mornings, I only have about 15-20 mins to finish cooking and pack the lunch before Sikander leaves for office. Ever since moving to a largely vegetarian and gluten-free diet, 90% of the time lunch is salad. This warm spinach and chickpea salad recipe is a new addition to my morning on-a-run cooking recipes. The recipe requires only about 10 minutes of active cooking. 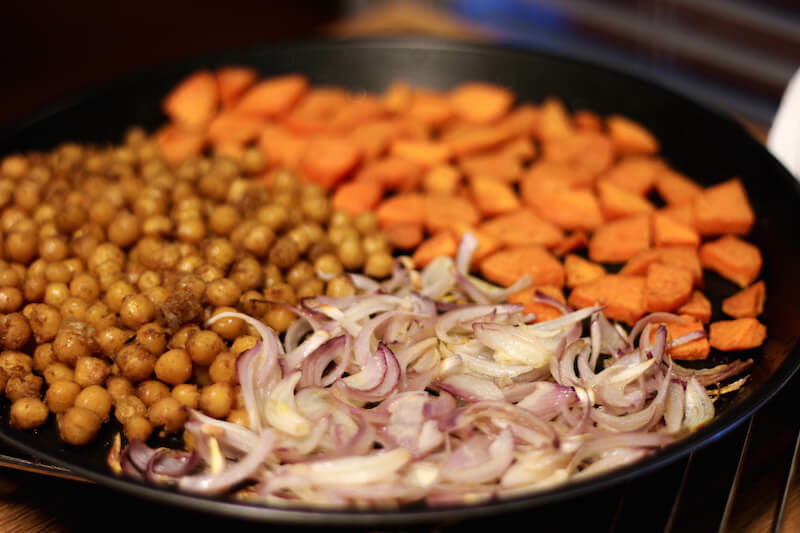 Just toss drained chickpeas with some spices; cut sweet potatoes and onions; drizzle with olive oil and let the oven do the rest while the morning chaos continues. The tahini salad dressing is super simple to put together — whisk together tahini, lemon juice, olive oil, maple syrup and some warm water and drizzle. I often add roasted veggies in salads like the southwestern style salad and the lentil salad. I love roasting veggies, especially sweet potatoes and onions for salads — it enhances their sweetness and also takes out the sharpness of onions. 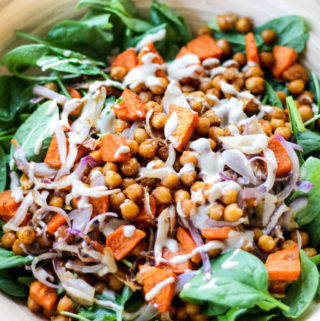 It also adds in lots of texture in this salad — the crisp and crunchy chickpeas, the soft sweet potatoes and slightly soft-with-a-bite onions. Chickpea and spinach are always a good idea. And just like that the chole masala plan was out and spinach salad with roasted chickpeas was in. And since it was chickpeas, the dressing that made perfect sense was tahini. You can never go wrong with chickpeas and tahini! I think that’s how the original hummus recipe must have developed! Raw baby spinach leaves are an excellent source of folate, vitamin A, vitamin C, vitamin K, magnesium and iron. It is low in calories, enjoys a high water content and provides lots of fibre. Chickpeas pack in a lot of plant based protein and sweet potatoes are abundant in healthy fibre. This deliciously healthy spinach salad can make a light lunch/dinner or a generous side dish. Spinach salad with spicy oven roasted chickpeas; sweet potatoes, and onions, drizzled with a lemony tahini dressing. 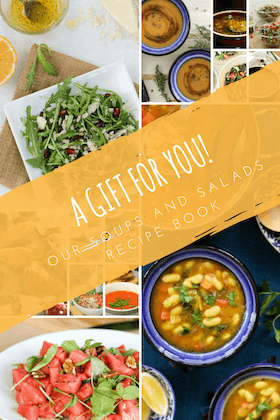 The salad is full of flavours and healthy plant based nutrition. In a mixing bowl toss the drained chickpeas with cumin, paprika and a little olive oil. Loosely spread on a baking tray and roast for 5 mins. In the same bowl, toss sweet potato with a little olive oil and add to the baking dish. Roast for another 10 mins with tossing every once in the middle to ensure even cooking. In the end add the sliced onions and roast for just about 2 mins. To make the tahini dressing, rapidly whisk together tahini, lemon juice, maple syrup, olive oil and warm water in a small bowl. At beginning it may feel like the tahini is breaking up but continue whisking and it will soon come together to a smooth flowing consistency. Add more water if needed. In a big salad bowl, add the spinach leaves, top with all the roasted veggies and drizzle the tahini sauce. Serve warm with some more dressing on the side. If packing in lunch boxes, pack in some extra dressing. 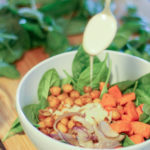 Whether you are dieting or not; Whether you are a looking for dishes high in vegetarian protein sources or not and whether you are a salad person or not — one mouthful of this warm roasted chickpeas and spinach salad and I can bet, you will be changed! By the way, have you ever tried tahini in an ice-cream? You totally should! Did you try this recipe? Send me a picture, leave a comment or connect with me on Facebook, Twitter, Google+, Pinterest and Instagram. Would love to start a conversation, share recipes, cooking experiences and food stories from India and around the world.